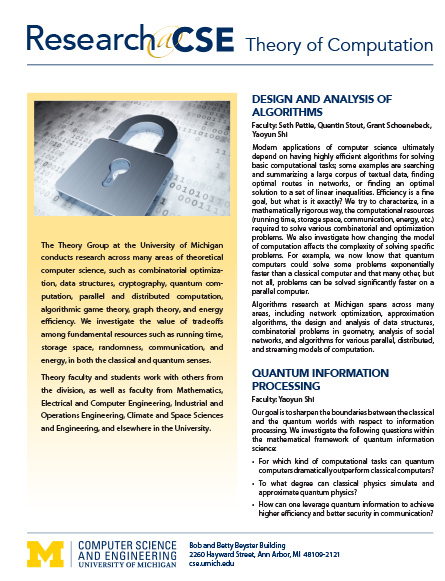 The Theory Group at the University of Michigan conducts research across many areas of theoretical computer science, such as combinatorial optimization, data structures, cryptography, quantum computation, parallel and distributed computation, algorithmic game theory, graph theory, geometry, and combinatorics. This website is a good source of information if you are interested in pursuing graduate studies in theoretical computer science or related areas. To apply for our graduate program in CSE, please visit our prospective student page on the CSE website.